Politicians and interest groups control the American political process. Special-interest groups – big business, big unions, education, seniors, and a multitude of others - seek favors: tax breaks, subsidies, exclusive legislation, etc. Interest groups give enormous amounts of money to political campaigns and receive gigantic benefits in return. Representative Eric Cantor (R-VA) is an establishment Republican and *was *very powerful. He excelled at courting and pleasing big business and Wall Street. In exchange for Cantor’s powerful help and protection, big business and Wall Street contributed enormous amounts of money to Cantor’s political campaign, which made him the second most powerful Republican in the House of Representatives. One example of the magnitude of power and money in the relationship between Cantor (a politician) and big business is his relationship with Boeing (big business). Cantor has long protected the Export-Import Banks, a federal government program which guarantees loans to foreign customers that purchase US goods. Boeing has made a billions of dollars because of these US government-loan guarantees made to foreigners. This year, it is estimated that Boeing will have sales of $10 billion with the help of the Export-Import Bank. Uh-oh...Cantor is defeated and the reauthorization of the Export-Import Bank is suddenly in jeopardy. Our stock market immediately reacted to the loss of Cantor’s protection of the Export-Import Bank, and the Boeing stock dropped over 2 percent. Americans must break the special interest corruptions between big business, big unions and powerful politicians. Cantor’s defeat is only a small step toward honest and better government. Americans need more politicians and philosophers similar to Mike Lee and Benjamin Franklin. I am generally very supportive of Mike Lee. I also recognize that it is very difficult to be entirely consistent with one's principles when elected to political office. Having said that, Mike Lee appears to be hypocritical in criticizing special interests groups when he himself is promoting the Shelden Adelson special interest of casino gambling as described in the article below. What am I missing here? Mike Lee says the Republican Party could become a majority party again by taking on crony capitalism and he’s right. The only problem is Republicans love the crony system and Mike Lee appears to as well. 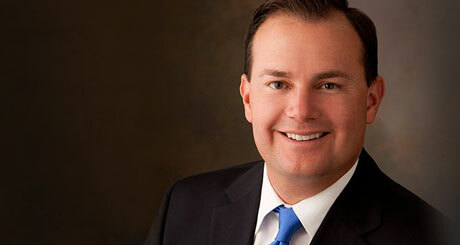 Mike Lee is right, anti-cronyist reform is badly needed but is he the man to lead that charge? I told you recently about a bill that Senator Lindsey Graham and Jason Chaffetz of Utah are pushing in order to ban internet gambling. The bill was created by a lobbyist for Sheldon Adelson the owner of the Venetian Hotel and Casino in Las Vegas. That bill would not only ban internet gambling moving forward but would also make it illegal in states where it is legal now. Senator Lee is among those pushing for the bill which doesn’t seek to ban are casinos, including the attempt by Adleson to open a new casino in Florida. Cronyism… using the power of law to eliminate competition for the very powerful. CNN recently caught Mike Lee holding a special ski weekend specifically for lobbyists which included unfettered access and Drew Griffen, the CNN reporter asked Lee about why he was giving access to the politically connected and powerful. Watch the video for Lee’s response. FreedomWorks was on hand to present our Activist of the Year Award while at the Utah G.O.P. Convention in Sandy, Utah August 15.